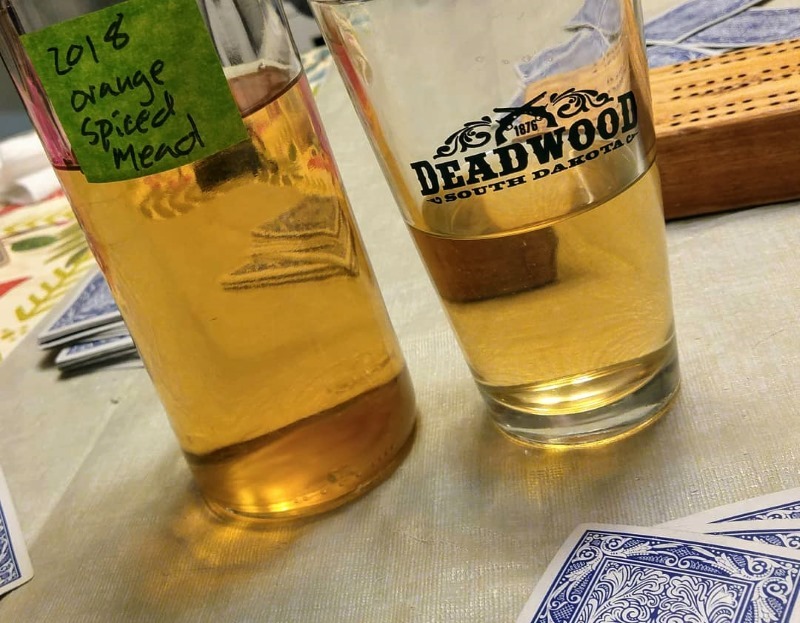 Joe Mattioli's "Ancient Orange Mead"
Quote Reply Topic: Joe Mattioli's "Ancient Orange Mead"
Since it is the beginning of a new project, I decided that it would be good to start this new thread as a chronicle of my efforts. I hope to add some history and other supplemental information as time passes. I have long wanted to try making mead; that is, a wine made using honey as its base. As someone who has an interest in food history as well as brewing and winemaking, it is one of those things that really appeals to me. Also, having a Scandinavian heritage, it seems that I would be destined to try this, at least once. I have seen several interesting recipes and variations...I even bought the honey to start the project at least twice; but other things always got in the way, and I never was able to commence with the actual deed. Over this past weekend, I rectified that oversight, and it looks like my first mead is off to a great start. Mead can be as simple as honey, water and whatever yeast happens to be floating in the air; I cannot prove it, but I am certain that is how this wonderful beverage originated. Having said that, once people found out how good this is, I am sure that they took some steps to produce the best mead that they could, given their limited knowledge, understanding and resources. One way to help with that is to "feed" the yeast that is fermenting the honey. There are commercial options, but this recipe manages to do that with two "natural" ingredients, oranges and raisins. Were these ingredients available to "the ancients?" Of course they were, either directly or via trade. The addition of some spices was also common, to liven things up. This recipe comes from Joe Mattioli, and I am posting it as I found it, grammatical errors and all. It is rather "colourfully" written, as you will see, but I believe that it helps the author underscore some key points about the way that the ingredients and method work together to achieve the goal. Install...airlock. Put in dark place. It will start working immediately or in an hour. (Don't use grandma's bread yeast she bought years before she passed away in the 90's)( Wait 3 hours before you panic or call me) After major foaming stops in a few days add some water and then keep your hands off of it. (Don't shake it! Don't mess with them yeastees! Let them alone except its okay to open your cabinet to smell every once in a while. The amount of honey I used was probably an ounce or three shy of 3.5 pounds, but I am sure it will be fine. The biggest share of it was raw, unfiltered Montana honey, while half a pound of it was a blend of Montana honey and Montana huckleberry, just because that is what I had on hand. I grated what looked like a pinch of nutmeg off of a whole...nugget? Nut? I am not sure what it is called. It might have been a bit more, but I am sure this will be fine, too. Having no Fleischmann's yeast, I used a generous teaspoon of "Western Family" yeast, which is distributed by a regional grocery chain. As with everything else above, I am willing to bet that this will be fine. One other variation involved the orange that was used. The Number One criticism of this recipe (other than the yeast, which is generally looked down upon in spite of its being perfectly appropriate for this recipe) is that there is an objectionable bitterness from the pith of the orange that takes several months, if not longer, to age out of the mead. In order to preclude this, I wanted to zest and then juice the orange; unfortunately, I couldn't find one part of my juicer due to some sort of "mysterious disappearance. Undaunted, I zested the orange, then peeled it (pulling off any substantial "strings" of pith), then cut the segments into chunks and tossed everything in. My logic was that cutting the segments into chunks would also be much easier to remove from the fermenter later on. 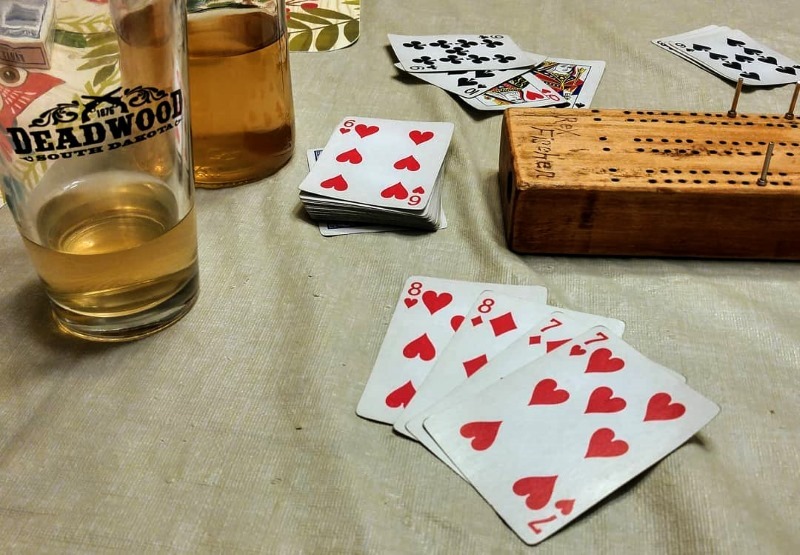 My son, Mike, who has made this before, said that he noticed no bitterness when he made his (pith and all), but by then I had already done it, so we will see how it goes. It will be fine, I am sure. Between the honey and about half a gallon of water (I used a local spring water that makes great beer), I had about 3/4 of the fermenter filled by the time I was finished. I decided to leave this alone for a few days or so until the most active period of fermentation is complete, then top up to a gallon. This is, of course, in accordance with the instructions. Fermentation took off almost immediately and has been active since then. The mead looks and smells great, so far, and I think it is safe to say that we are off to an auspicious start. I added about half of my intended "topping-up" water yesterday, and will probably add the rest tonight, in order to be at a full gallon. From there, I will leave it alone and wait until at least two months have passed; at that point, I will decide what to do with it. The mead is looking very nice at this stage; fermentation is still active; not screaming-fast or overly-vigorous, but it is chugging along nicely. It has a really nice aroma to it and I think we're proceeding along very well. Since things were looking good, I topped it up to a full gallon. I may have been a little premature with this, but I am sure things will be fine. Mead is an alcoholic beverage created by fermenting honey with water, sometimes with various fruits, spices, grains, or hops. The alcoholic content ranges from about 8% ABV to more than 20%. The defining characteristic of mead is that the majority of the beverage's fermentable sugar is derived from honey. It may be still, carbonated, or naturally sparkling; dry, semi-sweet, or sweet. Mead was produced in ancient history throughout Europe, Africa and Asia, and has played an important role in the mythology of some peoples. In Norse mythology, for example, the Mead of Poetry was crafted from the blood of the wise being Kvasir and turned the drinker into a poet or scholar. Pottery vessels dating from 7000 BC discovered in northern China have shown chemical signatures consistent with the presence of honey, rice, and organic compounds associated with fermentation. In Europe, it is first attested in residual samples found in the characteristic ceramics of the Bell Beaker Culture (c. 2800–1800 BC). Take rainwater kept for several years, and mix a sextarius of this water with a [Roman] pound of honey. For a weaker mead, mix a sextarius of water with nine ounces of honey. The whole is exposed to the sun for 40 days, and then left on a shelf near the fire. If you have no rain water, then boil spring water. There is a poem attributed to the Brythonic-speaking bard Taliesin, who lived around 550 AD, called the Kanu y med or "Song of Mead." The legendary drinking, feasting and boasting of warriors in the mead hall is echoed in the mead hall Din Eidyn (modern day Edinburgh) as depicted in the poem Y Gododdin, attributed to the poet Aneirin who would have been a contemporary of Taliesin. In the Old English epic poem Beowulf, the Danish warriors drank mead. 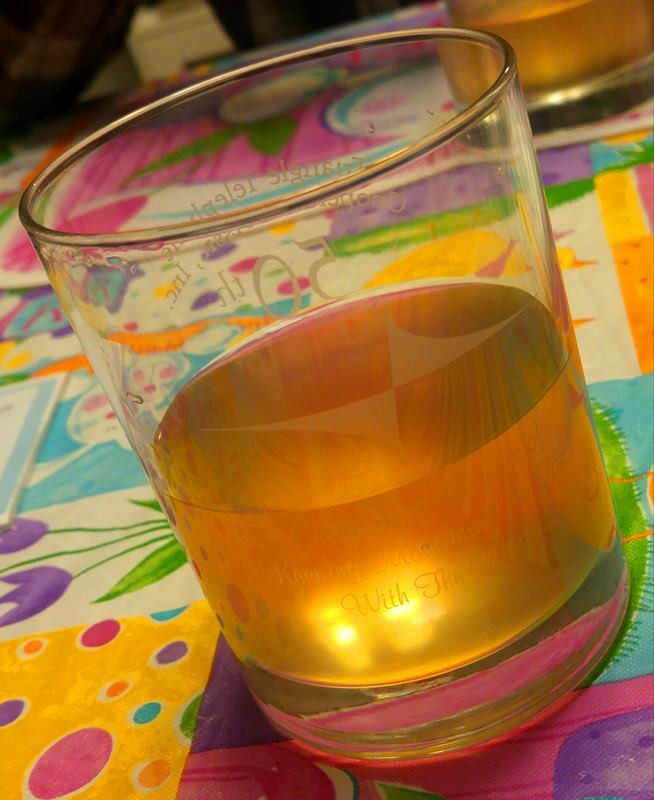 In both Insular Celtic and Germanic cultures mead was the primary heroic drink in poetry. Later, taxation and regulations governing the ingredients of alcoholic beverages led to commercial mead becoming a more obscure beverage until recently. Some monasteries kept up the old traditions of mead-making as a by-product of beekeeping, especially in areas where grapes could not be grown, a well-known example being at Lindisfarne, where mead continues to be made to this day, albeit not in the monastery itself. Historically, meads were fermented with wild yeasts and bacteria (as noted in the recipe quoted above) residing on the skins of the fruit or within the honey itself. Wild yeasts can produce inconsistent results. Yeast companies have isolated strains of yeast which produce consistently appealing products. Brewers, winemakers and mead makers commonly use them for fermentation, including yeast strains identified specifically for mead fermentation. These are strains that have been selected because of their characteristic of preserving delicate honey flavors and aromas. I bottled this mead last night, and I believe it is going to be pretty good! The bottling went fairly well; I got about 4.5 bottles out of the total gallon, which is pretty good considering that there was a lot of "sediment" in there from the yeast, the orange zest/pulp, the raisins etc. Bread yeast does not flocculate very well, meaning that it does not settle and pack down the way other brewing and vintning yeasts will do. I did "cold-crash" the fermenter for a couple of days, and this helped quite a bit to settle the yeast down. The half-bottle was sampled and we were pretty impressed with it. I think with a little bit of aging it will be really good. It might be a very wee bit sweet for my taste, but I certainly will not criticize it. 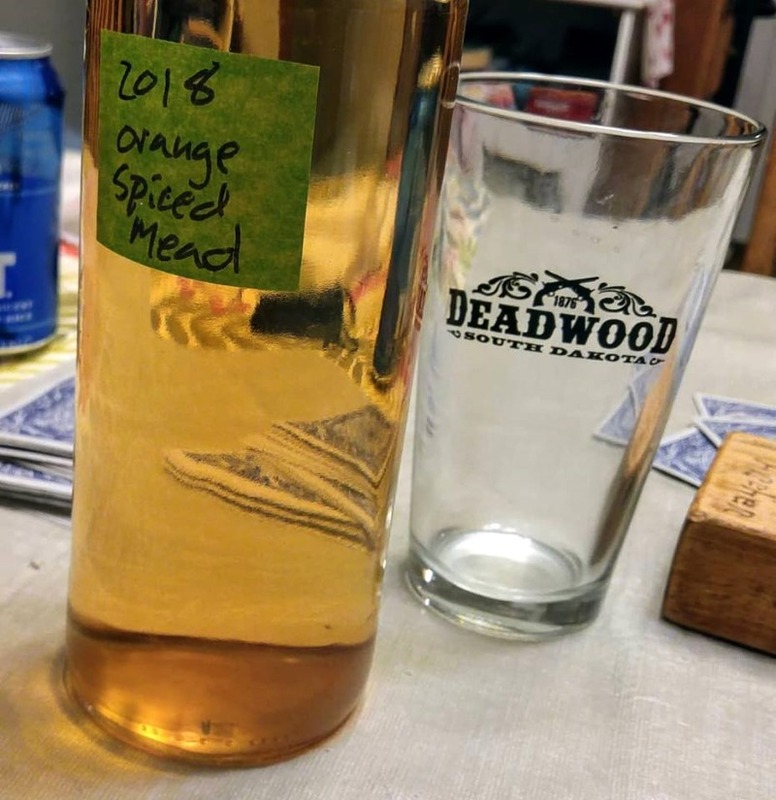 The recipe - as written - tells you to include the orange peel for a reason; this is, I believe, in order to balance the inherent sweetness of this mead. I departed from that instruction, so the consequences are mine. Having said that, it tastes pretty good, anyway! I'll give it a month or two to settle from the "bottle shock," then will see how it is. The bulk of this mead will be held in reserve until Christmastime, when it will, I think, be a welcome part of the holiday cheer. Well, everyone - I am going to call this a success! The mead is actually much more clear than the photo indicates; I took several pictures, but the one that turned out best was from the last glass that we poured, so a little bit of sediment had kicked up; considering the bread yeast that is used, it only takes a little to affect the clarity. The taste, in my opinion, is what counts, and this was very good. The spices were in perfect balance, for me, and the honey came through beautifully. I know that by mead standards this is very young, but I honestly don't see why it can't be enjoyed - and enjoyed very much - at this stage. As noted above, the only major departure from the recipe/method is that I used orange zest rather than whole peel; this worked well for me, but it was probably a mite sweet, compared to what it "should" be. I liked it this way, but the next time I make it I will use the whole peel; Ill then compare the results and go forward with what I prefer. Other than that, I wouldn't change anything. The orange and spice are spectacular here, and make a very drinkable mead. I have a good supply left that I will "try" to save for Christmas, but it may not last that long. If you want to dip your toes into meadmaking, this is a great gateway and worth a shot; just remember that it does break a lot of "rules," but if you follow it, you will end up with good results. Since my last post in April of 2018, I had been keeping my mead safe in a dark corner, intending to check on it again around Christmastime. Unfortunately, I forgot about it even then, and didn't remember it until mid-February! When I tasted it, my impressions were the same - it was great! A very nice, well-balanced combination that didn't seem too "hot," too "sweet," too "spicy" or too "orange-y." I honestly couldn't think of a thing wrong with it, and was very happy with it, and hope that I can make it as well, next time. As has been said many times, trust the recipe. It may break a lot of "proper" rules, but for this application, every step is there for a reason, and contributes to a marvelous end. Give it a shot - you will not be disappointed! I read your original post and saw the diss of Fleischman’s yeast for wine-making. Honestly, my Transylvanian grandmother used to make wine from her own grapes, white and red, about 50 gal a year. She used 4 ingredients - a sulphur stick to sterilize the barrel, juice from her own grapes (crushed and naturally fermented in their own skins for a week), white sugar to taste and Fleischman’s yeast. No sweeteners, no specific gravity gauges, no clarifying or stabilizing agents. 6 months in the barrel, the sediment settles and it clarifies itself. In fact, I took over the winemaking after she died and until they sold the farm. Same recipe. I made a batch for my sister’s wedding, for the toast to the bride. About 1/3 of the guests kept drinking the wine the rest of the night, ignoring the open bar! Same with my grandfather. He made a lot of wine, with chokecherries, bullberries, watermelon, crabapples - even beets, and I am sure many more. He always used bread yeast, and the wine was always very good.